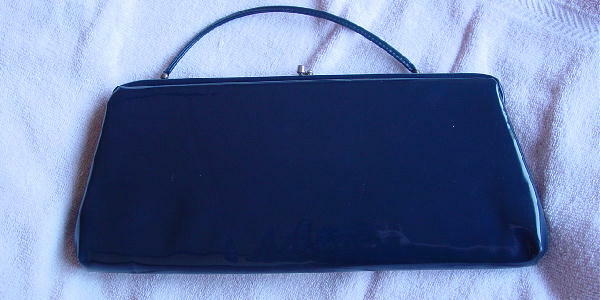 This vintage dark blue patina purse has a matching 9" long thin handle which can be tucked inside so you can carry it as a clutch. It has a gold-tone top rim and bypass closure. The blue fabric lining (feels like a satin-acetate) has a few snags and a red makeup dot. 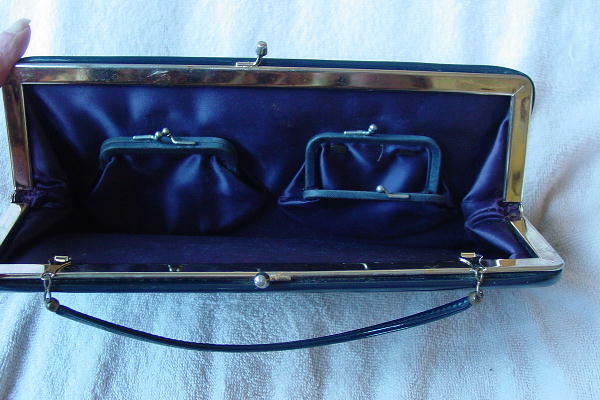 One interior side has two fabric matching change purses with bypass closures. They are each attached to the purse by 2 upper brads. It was made in the USA. There are light surface scratches and some indentations in the surface on one side. What looks like a mark at the bottom right side is an effect from the flash.